The SWISS GT 26 automatic turning machines with a complete standard equipment package at a competitive price. Simple and ergonomic, the Swiss GT range offers easy access to all tool positions. It is easy to use and maintain thanks in particular to its automatic lubrication unit, a swarf tray and a high volume removable oil pan. The Swiss GT 26 may be fitted with up to 40 tools, including 14 rotating tools, . The Y axis offers greatly increased machining capability in secondary operation and allows some complex workpieces to be produced without reworking. In addition the B axis *(option) appreciably extends the Swiss GT 26’s capabilities, allowing it to tackle almost any part. 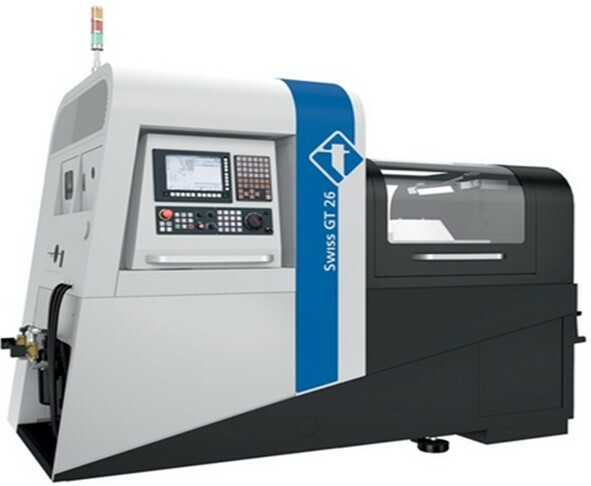 The Swiss GT 26 B is the only Swiss-type lathe equipped with a B axis featuring a modular position that can incorporate either a fourth rotating drilling station or a true thread-whirling head.